Solar-Breeze NX2 Robotic Solar Pool Cleaner is an eco-friendly, sun-powered robot that skims the top of the pool to clean leafs and debris before they sink. No cords, hoses or electrical connections. item 2 Brand New Solar-Breeze NX2 robotic solar pool cleaner New for 2018! -Brand New Solar-Breeze NX2 robotic solar pool cleaner New for 2018! I have this for about 2 weeks. Its fair. The bad season is not here as yet and so this is an incomplete evaluation as I cannot evaluate it for the true reason for which I purchased it. I was able to turn off the skimmer though and the pool still seem clean. In a few months when the season hits I’ll be better able to say whether it was worth it. Like a maid for the pool. It worked right out of the box. Very happy with the results. It is pricy but it is for a swimming pool. They see you coming. I’ve had my Solar Breeze for almost a year now. 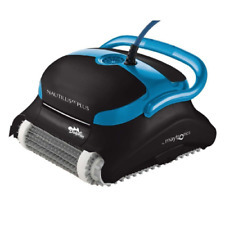 I love this machine as it keeps my pool extremely clean. It does get stopped by the pool sweep hose frequently, however, it breaks free quickly. Though it’s expensive, it has been worth every penny.